Use the management & coordination experience we’ve gained across oodles of industries from small business to corporate. Access our team of big picture thinkers, who also know how to muck in. Get help navigating the myriad marketing options, to focus on a solution that has real, tangible benefits. Inject purpose and clarity into how you market your business by building a plan. Achieve practical business results that directly impact your bottom line. Are you in need of a marketing business to help take the pressure off? You are great at what you do, full stop. But that doesn’t mean you can create more hours in the day to get your marketing done, or that marketing is in your DNA. At InHouse Marketing we believe the power of marketing should be accessible to you. We’re a humble marketing business that’s all about using our expertise to find practical solutions that enhance your sales and marketing outcomes, and having fun doing it. Large or small, we’d love to talk to you about your ideas and where we can work in to help. Uncover your brand, your unique identity and develop ways to live and breathe it through your logo, packaging and every day. Tell your story with purpose and seamless presentation – from digital to events, presentations to print – everything. Get a handle on market opportunities, harness new ideas and launch new products & services with excellence. Use your sales data and market research to better understand and speak to your consumers, and optimise the way you manage customer relationships. Take a look at the whole picture – marketing, sales, brand, distribution, pricing – and make a plan to maximise your marketing spend to achieve your goals. Use our knowledge to set your business up for the future, whether you need a general Marketing 101 or something more specialised, our team can help. Harness the power of marketing. We are a strategic marketing business who help busy, capable small-to-medium businesses like yours assemble the building blocks for business success. As consultants and do-ers we work alongside you as your inhouse marketing team, helping you with the thinking, planning and doing as you need it, and increasing your marketing and sales capabilities long term. 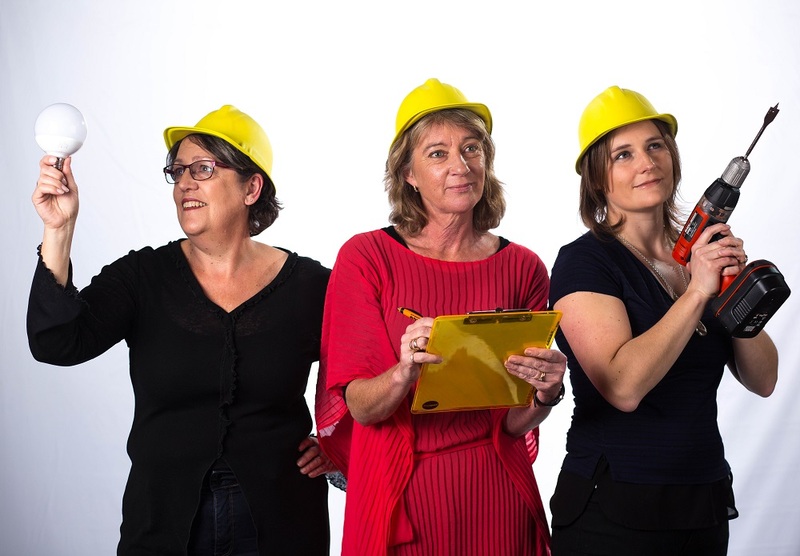 Your InHouse marketers Megan, Marise, Jodi & co, who put themselves through this questionable photo shoot just for you, will help you think, plan and do to achieve through marketing. We recognise every business and every project is different. That’s why we’ll build a proposal based on your needs. We can work on your business for an agreed number of hours per month, on a flat-fee basis, or project by project – it’s really up to you. Before embarking on this we do recommend having a think about what your budget is, and what you need to achieve. Our marketing business operates on a distributed office model (we work from our homes in glorious Hawke’s Bay! ), which helps keep our overheads (and prices) down so we can offer affordable solutions. We catch up with you for an hour (no charge) and get a feel for what you’re about, bringing to light your needs through our Marketing WOF which will be yours to keep (and you can suss us out too). We get to know your business goals, analyse your current situation and help you think about the future and your strategic options. You are the expert in your business, so we tap into your strengths and knowledge to understand what you need. We hatch a SMART plan together that includes the next steps required to achieve your strategic goals. Putting our coordinator hats on, we take the pressure off you by offering hands-on help to do what it takes to make it all happen. After our initial Needs Analysis meeting, if you decide to bring us on board then we use our THINK · PLAN · DO process for every project we work on together. Keen for a fresh take on your marketing?